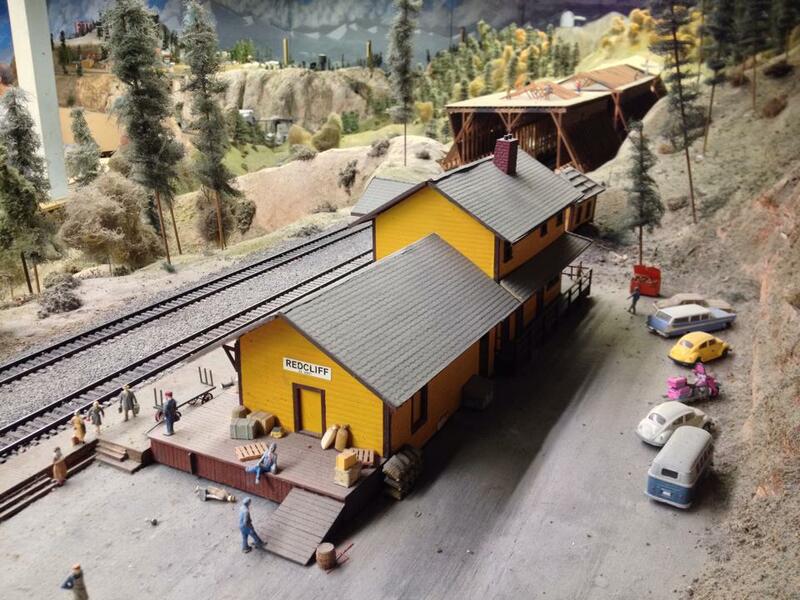 There are numerous model railroading clubs in Southern California, all devoted to various scale standards, and spread throughout a region not especially well-served by actual passenger rail. 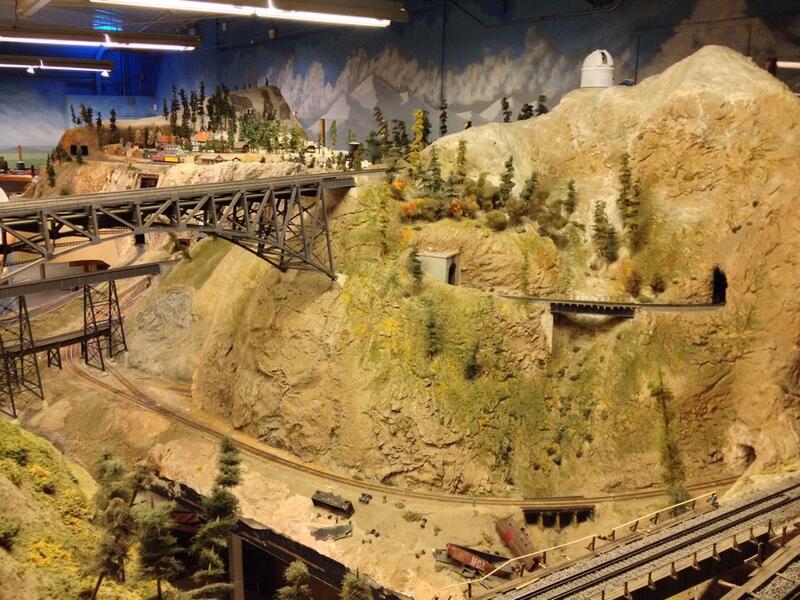 I recently decided to visit one such organization, The Pasadena Model Railroad Club. 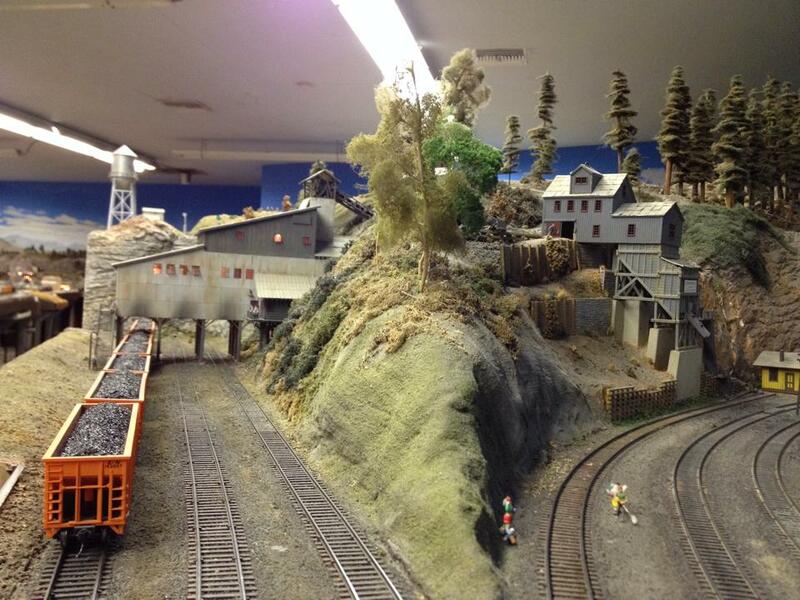 The Pasadena Model Railroad Club is one of (and possibly the) oldest model railroad clubs in the region, established in 1940. The oldest extant model railroad club in the world is apparently The Model Railway Club in King’s Cross – established in 1910. Before that, most miniature trains had been viewed as children’s toys rather than a reasonably respectable adult hobby. 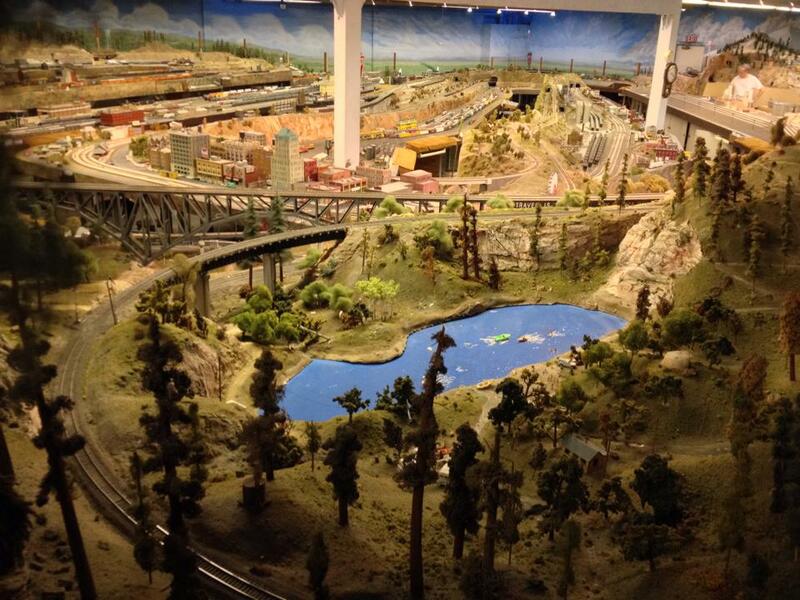 The first toy trains are almost as old as the steam locomotive itself, having first appeared around the 1820s. By the 1840s there were so-called “carpet railways,” trackless toy trains with “live steam” engines. Electric model trains first appeared in 1897. When I was a child, I was the proud owner of a model train with three engines from different eras. I never considered joining a rail club and generally preferred to conduct my operation undisturbed by others. Had I wanted to join a club, had I lived in Southern California rather than Central Missouri, and barring any minimum age requirements, I would’ve had numerous clubs from which to choose: the All Gauge Toy Train Association, Angels Gate Hi-Railers Model Railroad Club, Antelope Valley Model Railroad Club, Antelope Valley N’Scalers, Belmont Shore Model Railroad Club, California Southern Model Railroad Club, Citrus Empire Model Railroad Club, The Coachella Valley Model Railroaders, The Corona Model Railroad Society, Glendale Model Railroad Club, The Highland Park Society of Model Railroad Engineers, San Diego Society of N-Scale, Slim Gauge Guild Model Railroad Club, Southern California N-Scale, and the ’20s & ’30s Modular Model Railroad. I would’ve surely been one of the youngest members of any club but hardly the only male. The trains of my imaginary railroad traversed an unimpressive, half-finished landscape of plaster, particle board, and a few model buildings located amongst groves of fake trees and reindeer moss. 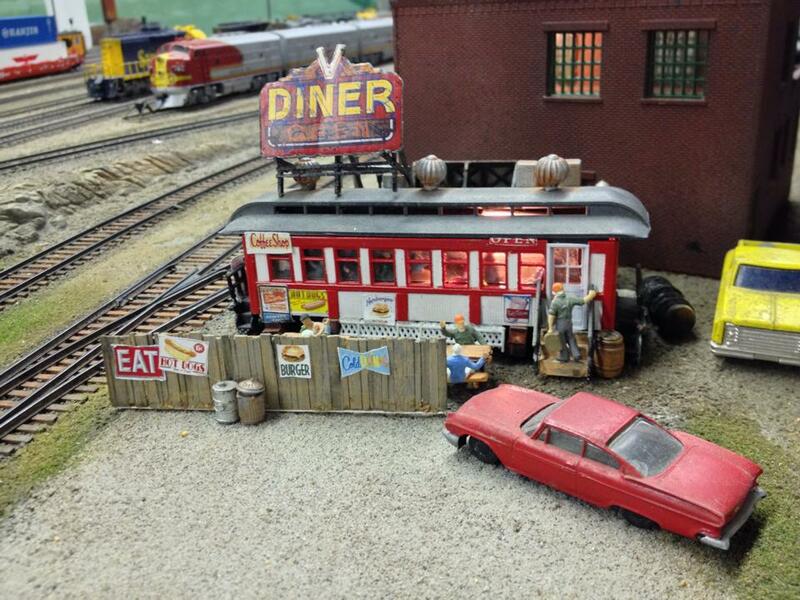 The layout of a model railroad club is much more impressive than those found in most homes — with the exception of affluent celebrity enthusiasts like Frank Sinatra, Rod Stewart, and Gary Coleman. My trains were HO Scale (1:87), the most popular, and the same scale as Pasadena Model Railroad Club’s Sierra Pacific Line. Before them, larger O scale (1:48 to 1:43.5) model trains had been the most popular. 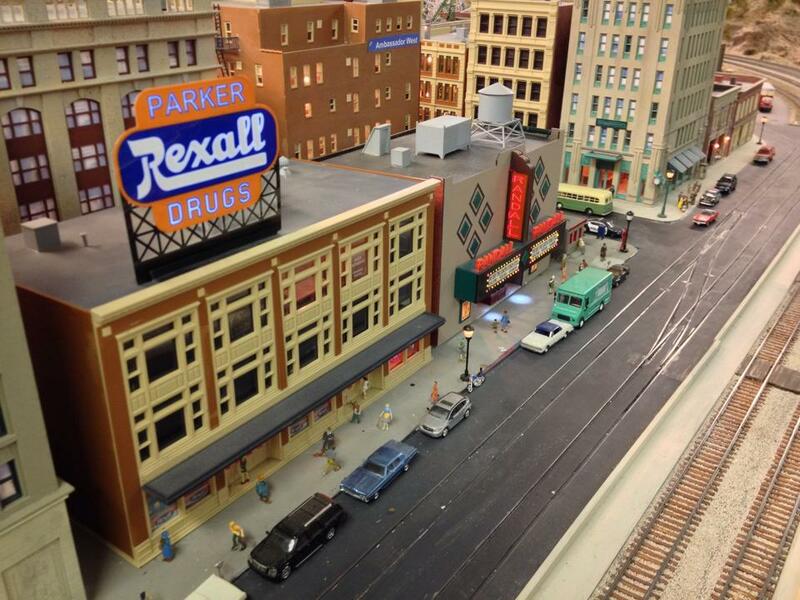 Model railroad trains come in more than fifty scales, from the (1:220) Z Scale up to the ridable live steamers (1:24 – 1:8) and the grand scales (1:4 and up) commonly found in amusement and theme parks. A converted rail car diner! After scale the serious model railroader must consider what company’s trains to operate and from what era. Although the model railroaders of the Sierra Pacific seemed to communicate in a strange mixture of jargon, in-jokes, and English, if I understood correctly, they also keep written records of the presumably imaginary contents of their trains’ freight cars. I attempted to draw conclusions from their choices but my questions were mostly brushed off. People chose railways generally because of the operators’ geographic origins, not because what rail agencies one is drawn to is a reflection of the operators’ personalities. However, in at least one case someone chose his company because they were the rival of his unloved former employers. I was told that in the past there had been operators of interurban and light rail but not currently and on the railroad as in real life, freight rail takes president over public transit. Back in 1940, when the PMRC was founded, the privately-owned Los Angeles Railway and Pacific Electric Railway were both still in operation. Santa Monica Bus Lines, Culver CityBus, and Montebello Bus Lines were all just about a decade old and Gardena Municipal Bus Lines and Torrance Transit were brand new – all outlived their rail rivals and still operate today. In 1940, when discussing Adolf Hitler‘s missed opportunity to destroy the UK and France, Neville Chamberlain tellingly said that Hitler had “missed the bus” rather than the train. However, as the world seemed to be increasingly forsaking passenger trains for buses, airplanes, and automobiles, model trains enjoyed their biggest explosion of popularity. Today model trains are most popular in Europe, East Asia, and especially the US. Although trains were once widely regarded as an outmoded (if nostalgia-inspiring) means of travel on par with the dirigible, in Europe and Japan they were updated and became the most efficient means of travel. Japan’s Shinkasen bullet train debuted in 1964 and today carries more than 150 passengers annually. In Europe, a vast network of high-speed rail crisscrosses most of Europe and opposition to the construction of the massively Channel Tunnel (or “Chunnel”) came almost entirely from ferry boat operators. The United States has the largest rail network of any country (more than twice the size of second place China), and also one of the most antiquated. There are few pockets of rail that could be described as “high-speed” in the Midwest and Northeast and the planned construction of the California High-Speed Rail is opposed by environmentalists, politicians, NIMBYs, and indeed, most of polled-Californians. 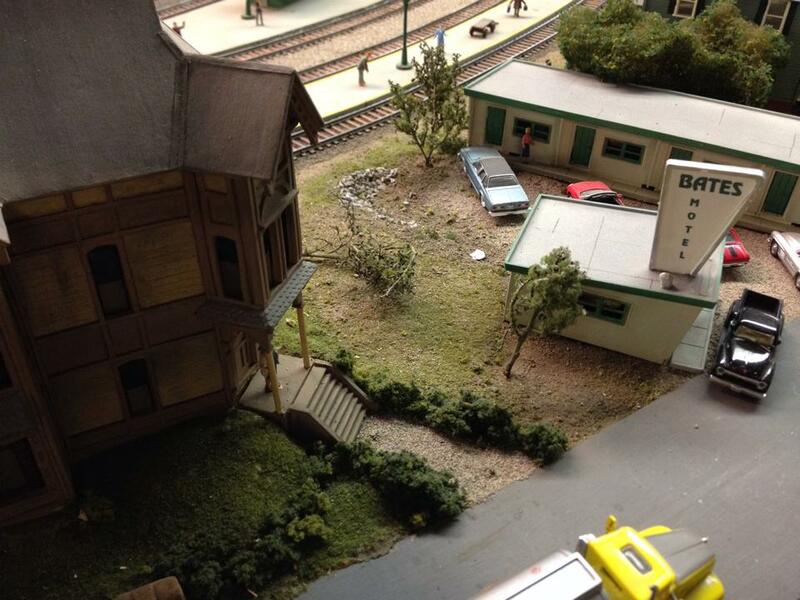 Although less controversial, the Pasadena Model Railroad Club has also been the victim of the prioritization of the automobile over that of the train. 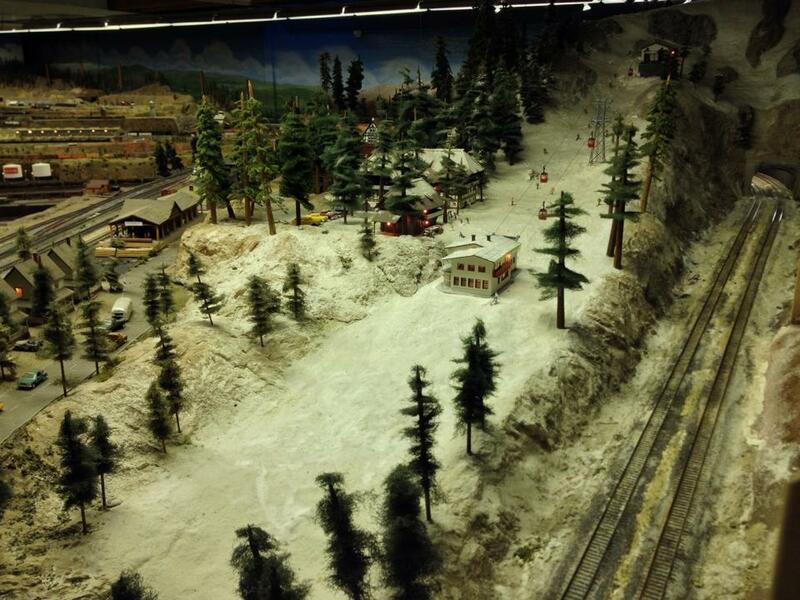 Despite its name, the Pasadena Model Railroad Club is not located in the City of Roses, but in the Gateway to San Gabriel Valley – Alhambra. The club was found in Pasadena, at 856 E. Maple Street, but had to move in 1963 to make way for the construction of the 210 Freeway. 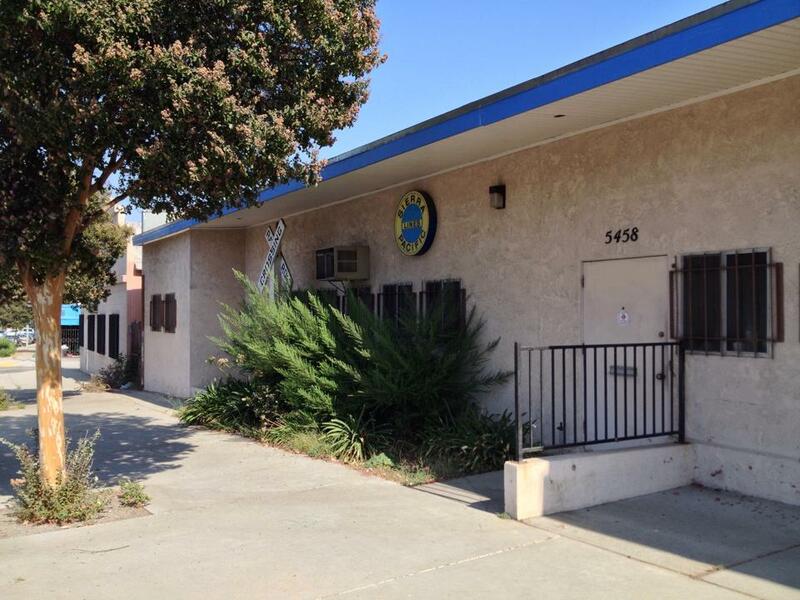 Today the club is located at 5458 Alhambra Avenue, right next to the tracks of a Union Pacific freight rail line. Despite the fact that Southern California has benefit from the slow return of passenger rail since the establishment of Metrolink and Metro in 1992 and ’93, respectively, it has a long way to go before it approaches the ridership of the bus. According to the American Public Transportation Association, Metro’s buses are boarded over one million times a day and there are more than 80 other bus transit agencies serving Southern California. The only passenger rail agencies currently in operation are Amtrak, Metro, Metrolink, North County Transit District, and San Diego Trolley provide passenger rail (and if your definition of passenger rail is extremely liberal, the Port of Los Angeles’s Waterfront Red Car Line and (when it isn’t closed for repair) Angels Flight). 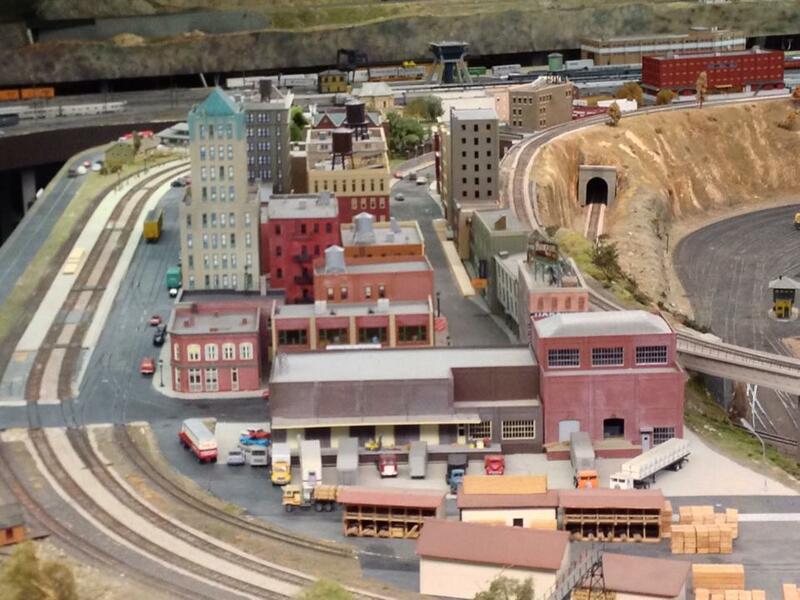 The Pasadena Model Railroad Club have open houses and meetings — check their website for times. Although the Sierra Pacific Line is served by miniature trains Southern Pacific, Union Pacific, and other agencies, in the real world the closest passenger lines to the club’s location are LADOT‘s DASH El Sereno/City Terrace and Metro‘s 76 lines.